Author Dr. Wisner Joseph Philemy‘s newly released “The Power of Illumination from a Godly Perspective” was written to acknowledge the omnipotence of God. “The Power of Illumination from a Godly Perspective” from Christian Faith Publishing author Dr. Wisner Joseph Philemy is a work whose sole purpose is to glorify the Lord and inspire a closer relationship with Him. 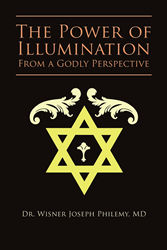 “The Power of Illumination from a Godly Perspective”: a book of reflection, contemplation, and inspiration intended to encourage others on their journey to knowing God. “The Power of Illumination from a Godly Perspective” is the creation of published author Dr. Wisner Joseph Philemy, the son of a deacon and Sunday school teacher who strives to use his God-given gifts in the service of others. Published by Christian Faith Publishing, Dr. Wisner Joseph Philemy‘s new book is a devout study of God’s omnipresence in the lives of those who believe. View a synopsis of “The Power of Illumination from a Godly Perspective” on YouTube. Readers can purchase“The Power of Illumination from a Godly Perspective” at traditional brick and mortar bookstores, or online at Amazon.com, Apple iTunes store, Kobo or Barnes and Noble. For additional information or inquiries about “The Power of Illumination from a Godly Perspective”, contact the Christian Faith Publishing media department at 866-554-0919.